Laura and Joe are partners in a small but growing business. They currently use QB and need to be able to remotely access customer information, invoices and payments that is inside QuickBooks when away from the office. They need the ability to easily and quickly look up information remotely about their customers from within the office and outside their office (and Gasp) at the same time! Neither Laura nor Joe is a computer expert. Their business will be soon expanding to add two more colleagues and they want the same ability to be extended to them after they join the company. The accounting process and controls established at their company dictate that only ONE user has full access rights to keep the books current and change data in the company’s accounting system. In the first two options below, they will need to configure a secure method to connect to the remote computer that hosts the QuickBooks Desktop application and database. This is typically done by allowing certain traffic to enter their company network through some designated ports and often only from designated authorized devices. This configuration is referred to as a Virtual Private Network (VPN). VPN - To their office network. Once connected, they would use a remote access application such as RDP to reach their desktop and then connect as they would if they were physically in the office. Remote Desktop - LogMeIn, TeamViewer, GoToMyPC, GoToAssist are examples of remote access software that in some cases combine the functionality of both VPN and RDP into an elegant method. Solutions that combine VPN and RDP functionality often requires that software needs to be installed and configured on each machine that is participating. In situations where software is not installed, a remote hand is required to approve or help move the process along. In the next two options, the QuickBooks Desktop software and database instance for their company will need to be installed on machines in the 'cloud'. QuickBooks Online - This is Intuit's solution to enable cloud functionality. Hosted Solution - This method will host your QuickBooks Desktop on a virtual server in the cloud. We have left other possible solutions out of this review because they require much more coordination amongst team members. Those solutions include DropBox, QBox, thumb drives or some other way of moving the data around. They introduce additional complexity such as version control and may also introduce possible data corruption in the transfer process. GoToMyQB - A new and elegant alternative to the above solutions. The software installs on the same machine as QuickBooks (on your office PC, Cloud or wherever you are hosting your QuickBooks) and provides remote access to the non-sensitive information to your team via a search web page. 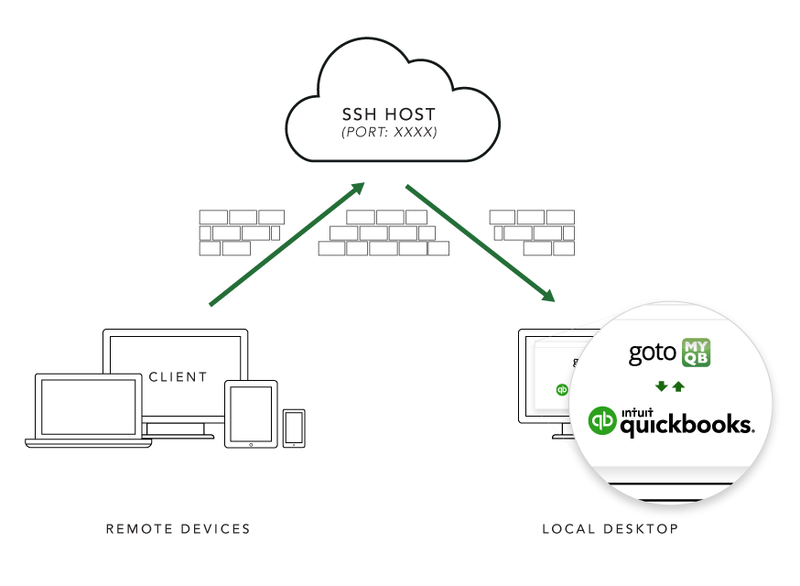 If you choose not to use the built-in Remote Access Service (with paid edition), you will still need to configure a secure way to reach your desktop (VPN discussed above) or open a specific port on your firewall to incoming traffic to the web server that is built-into the GoToMyQB software. QuickBooks does not need to be running for you to access the content inside QuickBooks. *Limitation: ONLY 1 user can access the company QB instance on that PC unless GoToMyQB uses a multi-user license. Please click here to download the FREE single user edition.